So who pays the most taxes in Greater Hartford? It’s not as easy to figure out as it might seem. All the talk of revaluations, budgets, and referendums got us thinking about how we could get at that question using the real estate data in the MLS. 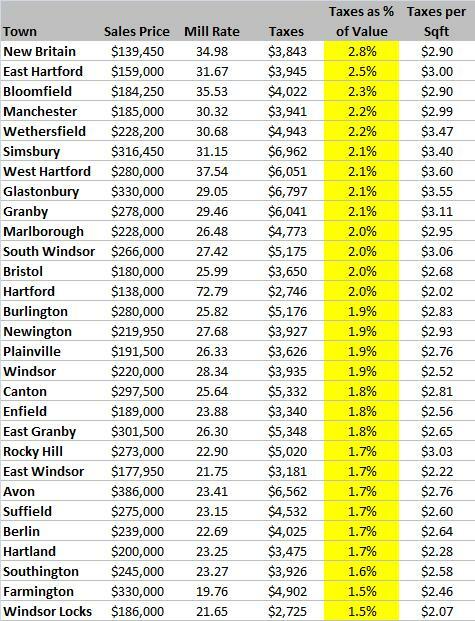 We decided to look at all the single family home sales in Hartford County that were input using the Grand List 2009 mill rates. The initial data set had just over 4,000 closed MLS transactions (deemed reliable but not guaranteed) with listing dates between July 1, 2009 and June 19, 2010, which should have been input using the Grand List 2009 mill rates. After eliminating deals with missing data, we ended up with just over 3,800 data points spread across 29 towns. Next we did some simple calculations and took the median values for everything. Ideally all of this data would have been published in a sortable table embedded in the post, but we couldn’t get it to work right (feel free to send tips or hints). Instead you’re getting the same large table sorted in different ways … our apologies in advance. The first sort is based on the dollar amount of taxes paid – who wrote the largest checks? Residents of the more expensive towns wrote the largest checks. Since the values of their homes are the highest, the tax bill – even at a lower tax rate – will he higher. What if adjust for the home prices? Who pays the highest percentage of their home’s value as taxes each year? With this adjustment, some towns with low median sales prices have moved to the top of the list, though some of the higher median sales price towns are also paying more than 2% of their home’s value in taxes each year. This time we see towns with smaller homes and higher median sales prices leading the pack. The results should be very similar to a sales price per square foot calculation. People end up paying the highest taxes per square foot in towns where they also pay the highest purchase prices per square foot. These results show a slightly different result that simply looking at the mill rates, though the mill rates are helpful as a quick first estimate. 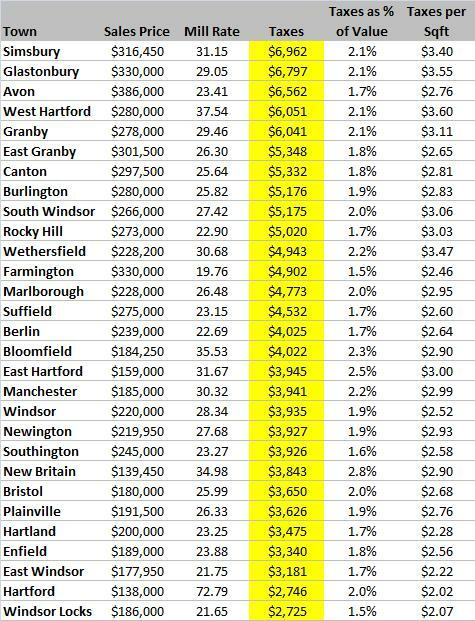 Farmington has some of the lowest taxes of the towns with high median sales prices, while Windsor Locks is the least taxed town with low median sales prices. Great data points! Awesome analysis. Luv it, Luv it, LUV IT! Thanks for taking the time. I would not use your created moniker, “dork”. You are much more apt to be called, “Real Estate Mogul”, IMHO. This is great. 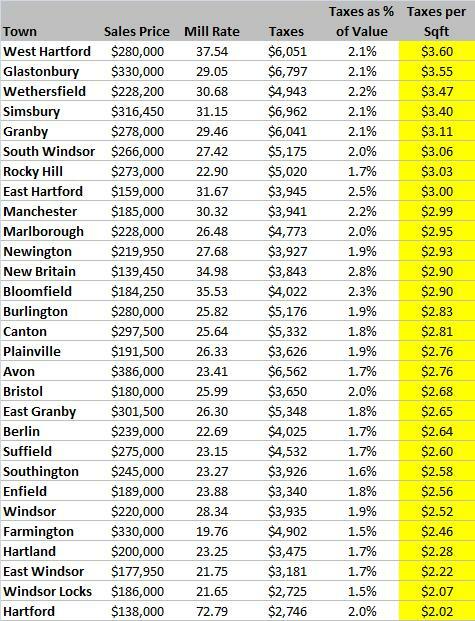 We are always debating about which towns have the highest property taxes relative to different factors. Thanks for this analysis!